I know! I know. It’s just the beginning of summer. … When you’re inspired. You’re inspired. I was working on designing a Christmas inspired winter red invitation that was truly unique. 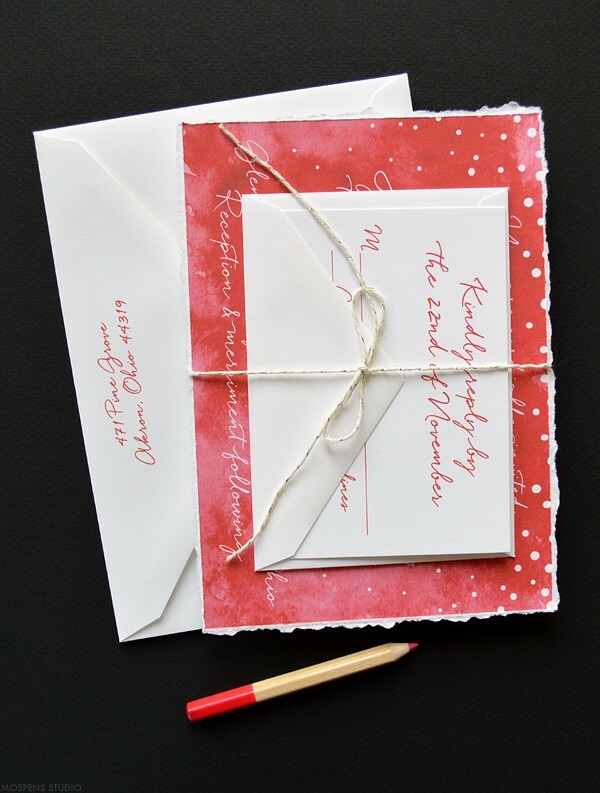 I quickly envisioned red watercolor with hand-torn deckled edging and a flurry of snowflakes dancing in the winter sky. 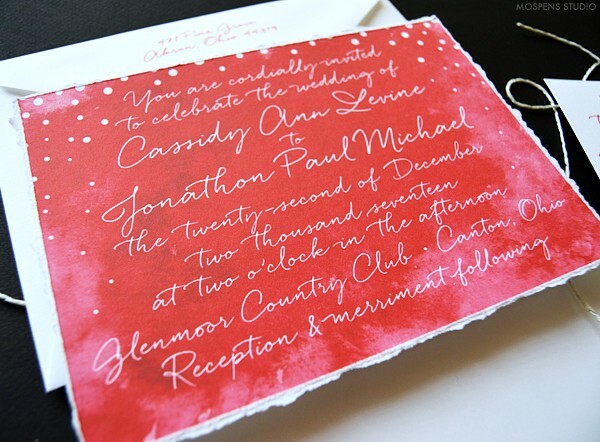 Snowflakes wedding invitations are popular for winter weddings. Oh so warm and inviting! 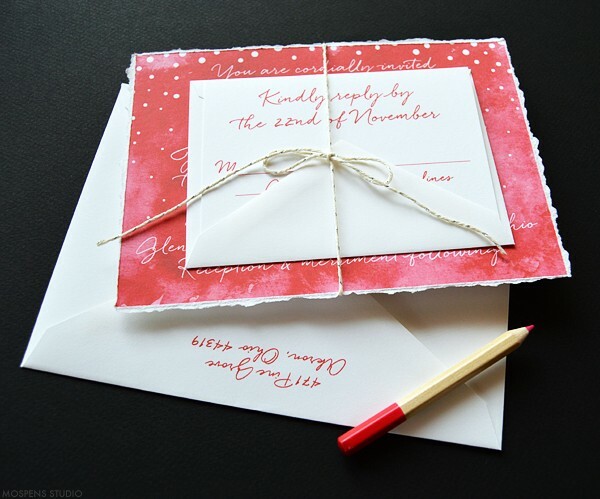 Send out your wedding invitations early if marrying over the holidays, 12 weeks before the wedding. 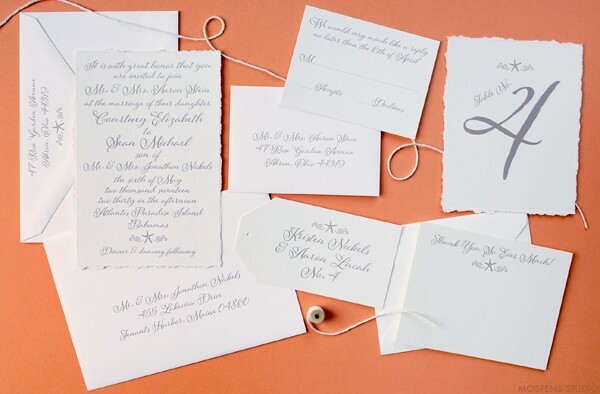 Bundle this design up with hand-tied white and silver twine. Of course! Matching thank yous, menus, table cards, and more available. In the shop! 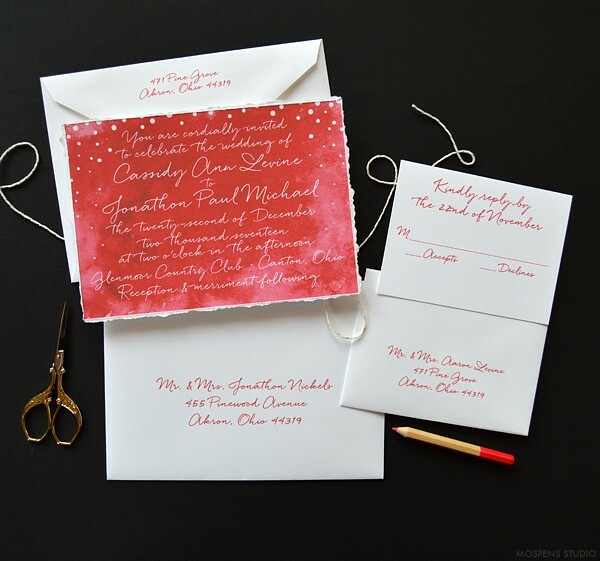 Look for more winter inspired invitations coming to the shop! 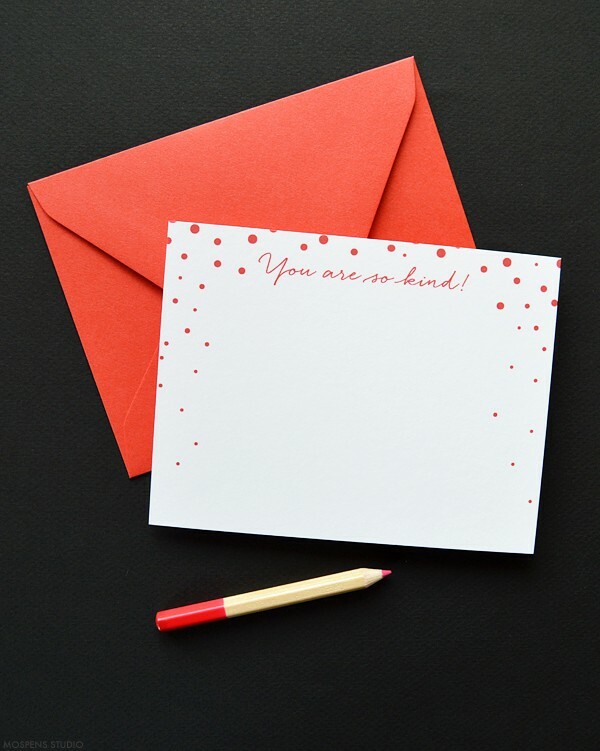 How do you write place cards? This is a FAQ here at Mospens Studio. After loads of research, I found many ideas and ways to write place cards. Surprisingly there are many options. 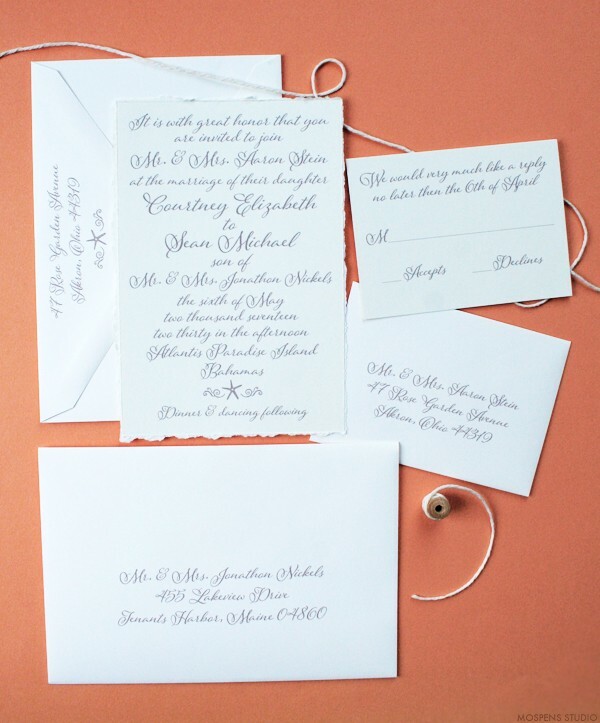 The idea of a place card is to help your guests find their seat. Otherwise they will look all around and be lost not knowing where to sit. Your guests will either pick up their place card when they enter your reception or a table seating sign will be at the entrance showing your guests what table they are sitting at, then a place card is already placed on each setting at each table showing your guests where to sit. This is used if Nick is the only “Mr. Gatsios” in attendance. If there are more than one guests named “Mr. Gatsios” then you would want to have his name read “Mr. Nick Gatsios” to avoid confusion. 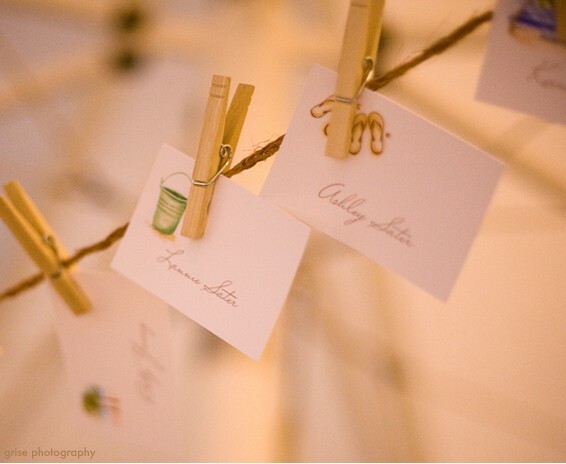 You want to find out your guests’ guest names and have a place card for each guest. “Mr.” is used for a man 18 years or older. An unmarried lady 18 and older is “Ms.” You will use “Miss” for unmarried girls under the age 18. Master is used for a boy until they are age 7. Mister is used when they turn 18. In between 7 and 18 there is no title used. Most times the table number is smaller and centered on the card. Another option is to print it on the right bottom corner. 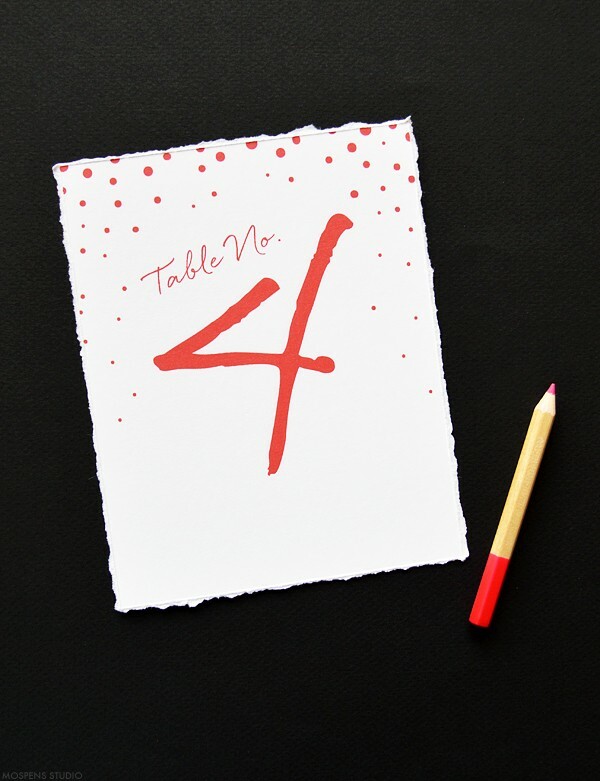 Many times our clients do not use table numbers but use different artworks to identify each table. Then on the place card (see the beach wedding place cards photo above) they use the art to show the guest what table they are seated at. Also, it is popular to use different beach names, city names, or other themed table names instead of table numbers. This is a way to make your reception creative and fun! and so on. You would list all guests seated at that table. If you caterer requires you to signify the food choice of each guest on the place card, you can do this by using different colors of ink, different motifs, or the cow, carrot, fish, … motifs. This will let the server see what entrée your guest chose and allow them to serve your guest in a professional manner. Often times you can print your guests names on the menus at the top. This will show your guests where to be seated and list the menu items that will be served. This way you do not need separate place cards if you are using menus. Saving you money. When your guests arrive to your reception, they want to be guided to their seat. You won’t be there to do so, but your place card will. You don’t want them guessing… where on earth am I suppose to sit? Having place cards ready at the door or a seating sign is a great way to show your guests you are thinking of them. Shop our wedding place cards, or have custom place cards created for you! 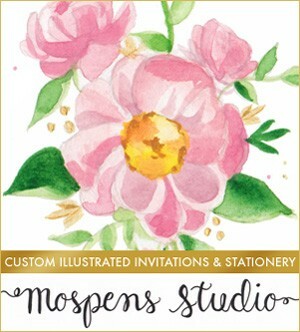 During the week I love working on designing new invitations and stationery with custom art for clients. 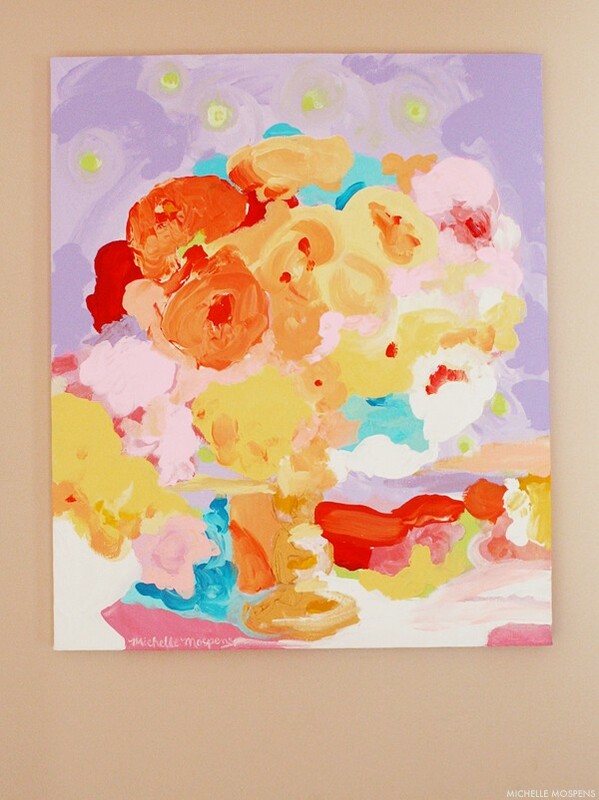 On the weekends I love painting on LARGE canvas. However, I have been so busy with invite clients that I haven’t painted since May. I really need to make more time to paint. 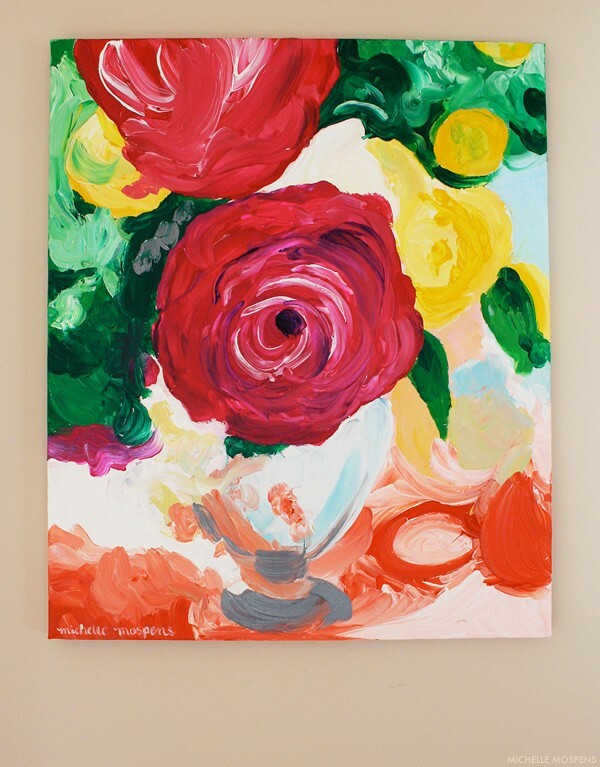 Hopefully this Sunday I can paint on large canvas again. 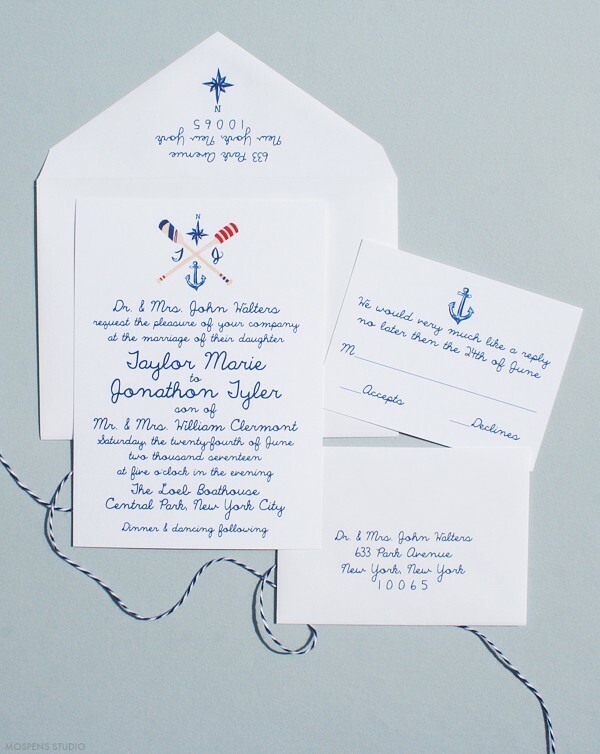 This beach wedding invitation is simply elegant! 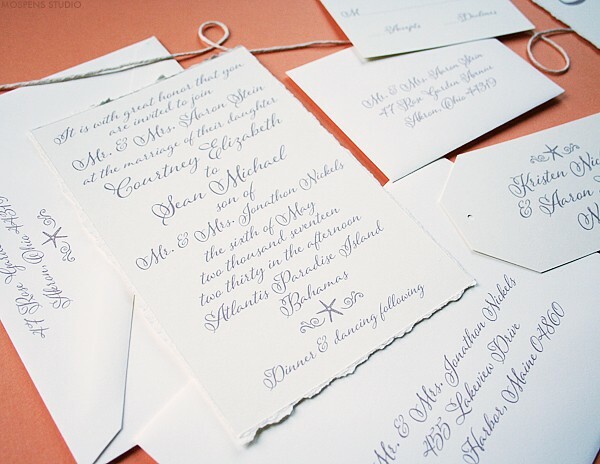 The hand-torn deckled edges and tropical taupe calligraphy gives this wedding invitation the perfect beach chic feel. The buttercream cardstock is perfect for a beach wedding. 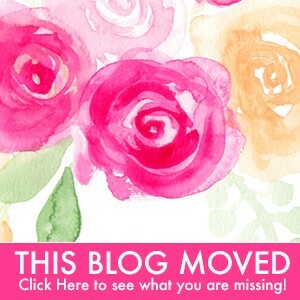 Matching save the dates, thank you cards, and more available. 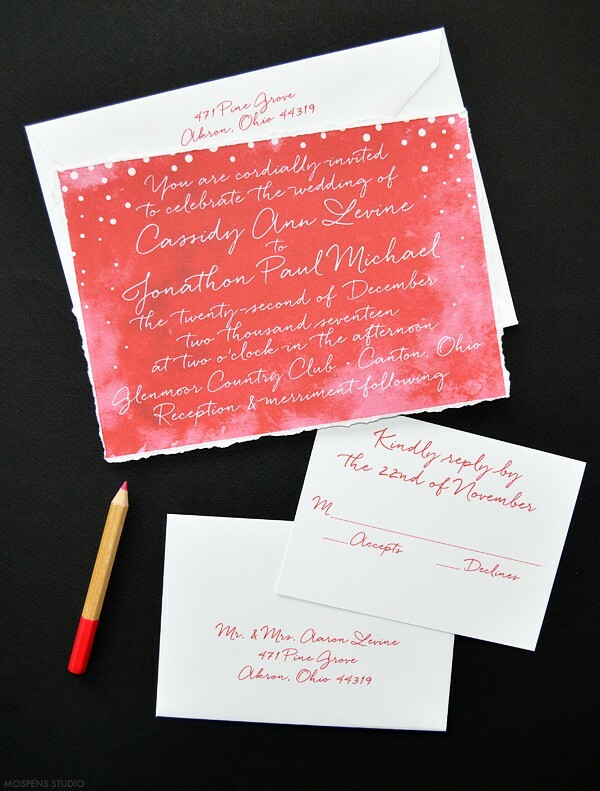 I am loving this new hand drawn wedding invitation design! It’s a SHORE THING. … Inspired by a beautiful day relaxing lakeside at our quaint summer cottage. I had to drop everything and put my brush to paper. Completely whimsical and fun. Watercolor captures a nautical design perfectly. 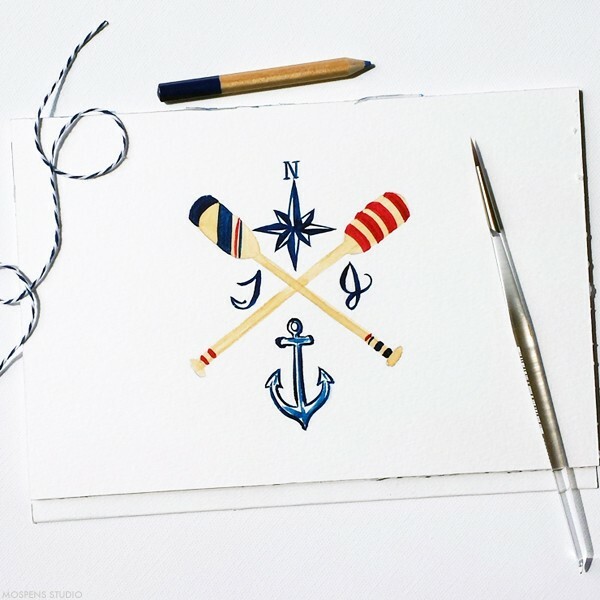 Hand-painted oars in navy and red combined with a hand drawn anchor and compass. Hand lettered monogram to match. 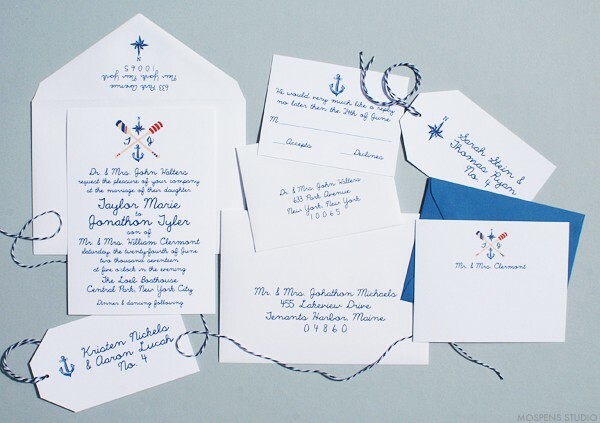 Hand-tied with navy and white striped twine pulls together this hand drawn wedding stationery design. 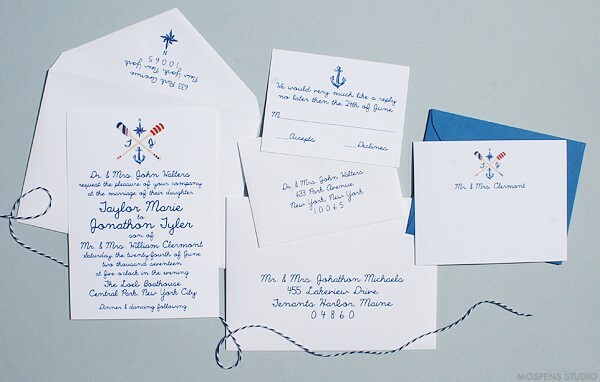 Follow up with a matching nautical thank you card with your married names.